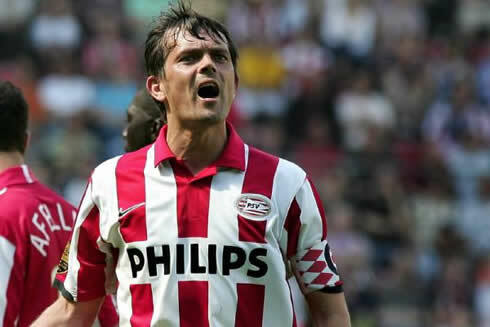 ﻿ Phillip Cocu: "Cristiano Ronaldo is a different player this season"
07.12.2011» Phillip Cocu: "Cristiano Ronaldo is a different player this season"
The former Barcelona player, Phillip Cocu, granted an interview to "MundoDeportivo.com" and as expected, he talked about Cristiano Ronaldo, Lionel Messi and a few other topics concerning Real Madrid and Barcelona. 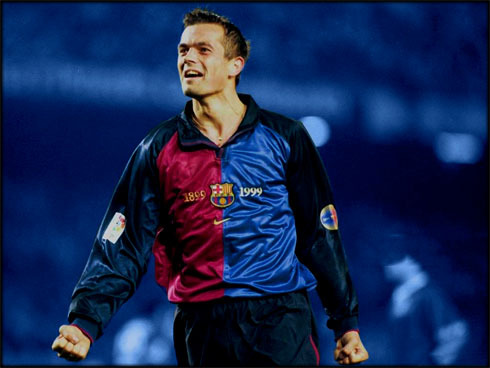 Phillip Cocu represented Barcelona between 1998 and 2004, so the Dutch player will be naturally rooting for Barça, on this weekend's "Clasico". Cocu believes that his former team will be the favorite to win this Saturday clash against Real Madrid, even though he recognizes that the Merengues have improved a lot since last season. As a proof of how better Real Madrid has became this year, Cocu pointed the name of Cristiano Ronaldo and stated that the Portuguese is now a very different player, who is more concerned with the team objectives. 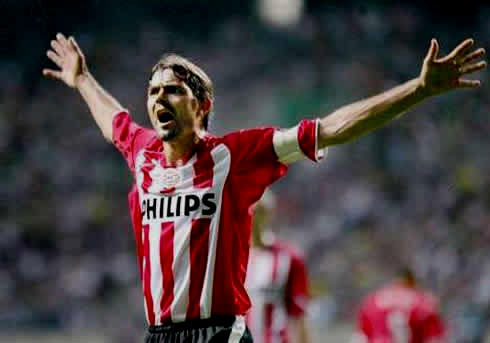 Cocu was born in 1970 and was a versatile player back in the days where he played for Barcelona. He's currently an assistant manager in PSV and in the Dutch National Team. The Dutchman had 292 appearences for the Blaugrana, which will remain being a club record when regarding exclusively foreign players, at least until next Saturday. The reason for that is the Argentinian Lionel Messi will pass that mark when he steps up in the Santiago Bernabéu this weekend, in order to play in the "Clasico" against Real Madrid. Cocu assures he's not sad to see his record being beaten and specially because the author of such achievement is one of the best players in the World, Lionel Messi. Cocu: "I'm not upset for losing this record. It's perfectly fine. It's always good to have such a long-term mark in a club as great as Barcelona, but if a player like Lionel Messi breaks it, it's just another proof of how valuable it is. I'm happy that it will be Messi doing it, since I rank him as the best player in the World", said the Dutch former player. One of the topics approached by Cocu was precisely this Saturday's "Clasico" and even though he thinks that Real Madrid is currently on a better form than Barcelona, he remains confident that his former team will be able to fight the adversities and come on top at the end of the day. Cocu: "Real Madrid seems to be slightly better at this point of the season, but in my opinion, the favorite will remain being Barcelona and they should be able to grab the 3 points. I believe that the recent games between the two clubs are still an important factor and the truth is that Barça has won most of the latest "Clasicos". 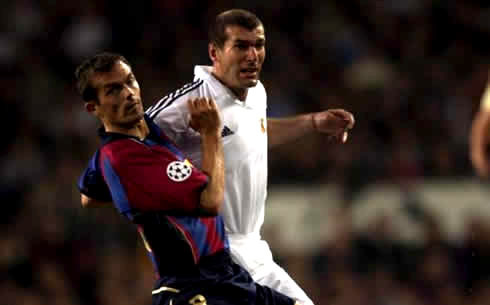 Barcelona always play very well in the Santiago Bernabéu and that allows the team to be very confident, at the same time as it frightens the hosts", pointed out Cocu when anticipating troubled times to Cristiano Ronaldo and Real Madrid. However, Cocu recognized that Real Madrid has improved a lot when compared to the last season and underlined how different Cristiano Ronaldo is this year. Cocu: "Real Madrid is definately a lot better than it was last season. They play better as a group and they all seem to be focused in helping the team towards its objectives. Cristiano Ronaldo is the best example of that change, since he's very different this season. He's a tremendous football player, but he used to be more selfish and now he's more interested in helping the group and assisting his teammates", noted Phillip Cocu. Real Madrid next game is against Ajax, for the UEFA Champions League, this Wednesday. Cristiano Ronaldo won't travel with the team to Amesterdam, since Mourinho has given him some rest, in order to be in top shape for Barcelona this weekend. Tonight, you can watch Ajax vs Real Madrid, as well as Basel vs Manchester United and Manchester City vs Bayern Munich for the UEFA Champions League. All these games are available from our soccer live streams section.